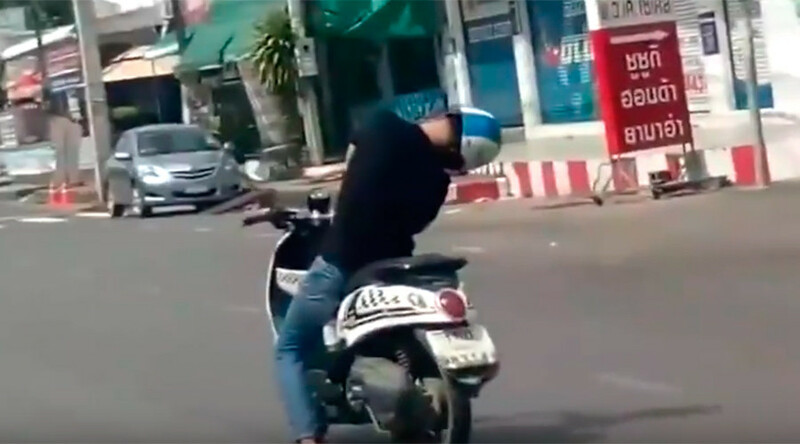 A shocking video has emerged online showing a man riding his moped down a street in Thailand while apparently fast asleep. The driver is seen dropping his head to one side in a snooze-like position while facing traffic head on. Thailand is known for its busy streets and often chaotic traffic, but this driver is oblivious to the motorists around him. The motorist in the car behind him, who recorded the footage, beeps the horn to wake him – but to no avail. Miraculously, the dozing moped man seems to instinctively veer across the road on a couple of occasions, avoiding a head-on collision. Of course, his luck was bound to run out eventually and the somnambulist rider is rudely awakened from his nap as he’s knocked from his bike after colliding with first the pavement and then a pedestrian. Passers-by come to their assistance, but it is not clear whether the helmet-wearing moped rider or the unlucky pedestrian sustained any injuries in the incident.